Kerala has high literacy, high life expectancy and other indicators of socioeconomic progress including access to state of the art medical care for those who can afford it. One would expect a lower prevalence of heart disease and diabetes. 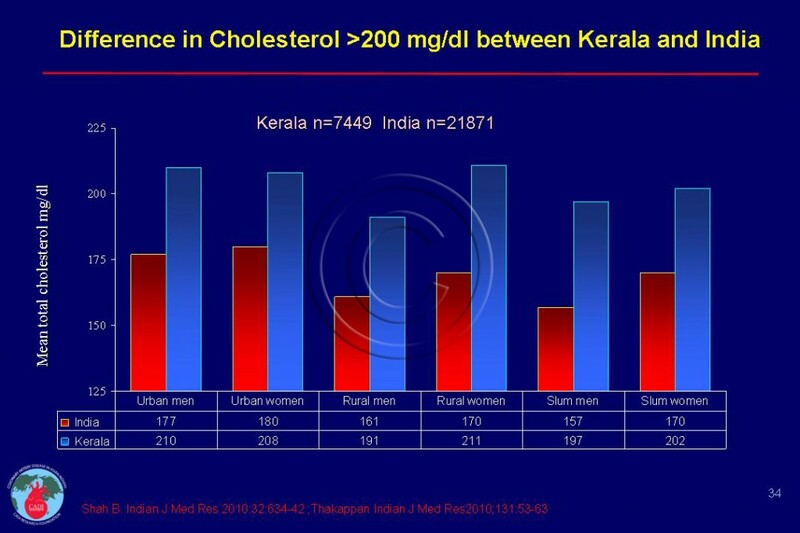 Kerala Paradox refers to the unexpectedly and paradoxically high prevalence of lifestyle diseases ─ heart disease, diabetes, high blood pressure, and obesity resulting in very high mortality and morbidity from CAD (coronary artery disease) (see Kerala Heart Disease). Coconut is used throughout India as God’s food (offering to God) but as a universal ingredient for cooking in Kerala. Total fat intake in Kerala is 30% of the energy with 70% of that (20% of daily energy) coming from saturated fat. 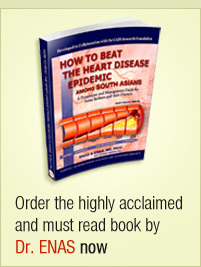 Special efforts are needed to educate the medical community and the general public about the culturally relevant ways of reducing energy from saturated fat in the form of palm oil, coconut oil, coconut meat, coconut milk, as well as full-fat dairy products to bring cholesterol levels at least to that of the remainder of India. See Indian Diet, Saturated fat, Trans fat and Contaminated Vegetarianism. 1. Thankappan K R, Shah B, Mathur P, et al. Risk factor profile for chronic non-communicable diseases: results of a community-based study in Kerala, India. Indian J Med Res. Jan 2010;131:53-63. 2. 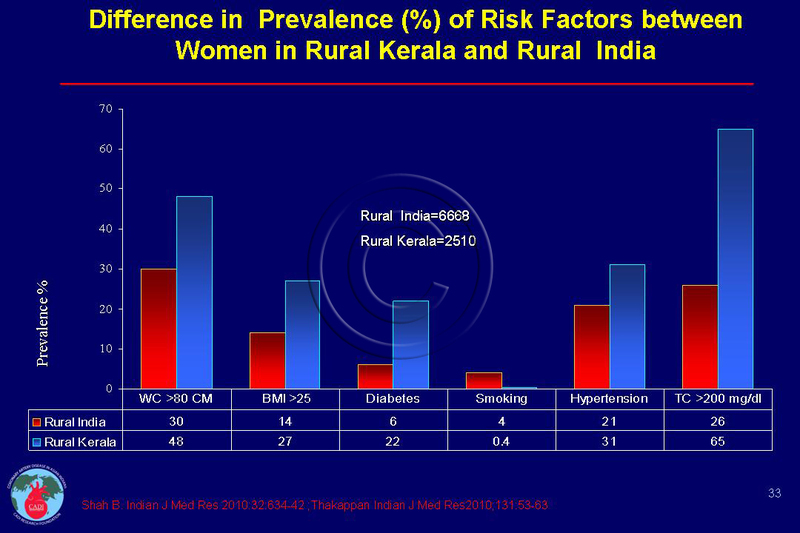 Shah B, Mathur P. Surveillance of cardiovascular disease risk factors in India: the need & scope. Indian J Med Res. Nov 2010;132(5):634-642. 3. Soman C. R, Kutty VR, Safraj S, Vijayakumar K, Rajamohanan K, Ajayan K. All-Cause Mortality and Cardiovascular Mortality in Kerala State of India: Results From a 5-Year Follow-up of 161 942 Rural Community Dwelling Adults. Asia Pac J Public Health. May 10 2010. 4. Soman CR, Shahulhameed S, Ramankutty V, et al. Cohort Profile: The PROLIFE study in Kerala, India. Int J Epidemiol. Sep 8 2009. 5. Joseph A, Kutty VR, Soman CR. High risk for coronary heart disease in Thiruvananthapuram City: A study of serum lipids and other risk factors. Indian Heart J. 2000;52(1):29-35. 6. Gupta R, Misra A, Pais P, Rastogi P, Gupta VP. Correlation of regional cardiovascular disease mortality in India with lifestyle and nutritional factors. Int J Cardiol. Apr 14 2006;108(3):291-300. 7. Sugathan TN, Soman CR, Sankaranarayanan K. Behavioural risk factors for non communicable diseases among adults in Kerala, India. Indian J Med Res. Jun 2008;127(6):555-563. 8. Kaur P, Rao T. Prevalence of cardiovacular trisk factors in an urban industrial population in South india. JAPI. 2007;55:771-776. 9. Mohan V, Deepa M, Farooq S, Prabhakaran D, Reddy KS. Surveillance for risk factors of cardiovascular disease among an industrial population in southern India. Natl Med J India. Jan-Feb 2008;21(1):8-13.